Well last Saturday went exactly as planned. 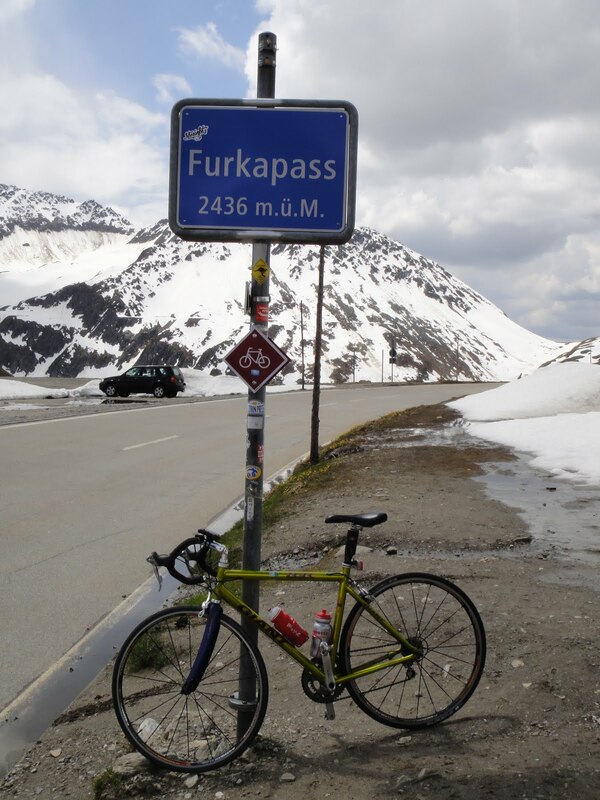 I took the train to Göschenen and then cycled the 3 passes of Furka, Grimsel and Susten. I usually prefer to start off with a flat section to get warmed up, but as soon as I got out of the train station I was greeted with the first climb up towards Andermatt. The climb was not too difficult but there was a lot of traffic and several dark tunnels where the cars don't see you so well to contend with. After making it safely to Andermatt I found the signs for Furka pass and headed eagerly towards it, ready for the serious hill climbing to begin. There is a long flat section after Andermatt before the climbing begins. Once the climb starts though you begin to ascend rather rapidly with a series of short, sharp switchbacks. The weather at this stage of the ride was beautiful and there were quite a few other cyclists ascending the pass. I overtook 2 and was gaining ground on another without trying too hard. I think the last month of cycle specific training is really starting to pay off now. 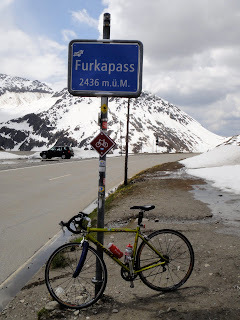 I reached the top of Furka pass without too much problem, took a few photos and then descended towards Gletsch. In Gletsch I stopped for some food. Time was getting on and I didn't want to hang around, but at the same time I wanted to keep up my strength for the following 2 climbs. I loaded up on a large plate of pasta and vegetables, accompanied by a random croissant, and washed down with a bottle of gatorade. I knew that I would need more food later on though, so I took a baguette, crisps and a cake with me in my rucksack. The next pass to tackle was Grimsel, but it wasn't too much of a big deal as from Gletsch you are already joining the Grimsel pass over half way up. In fact the sign just after Gletsch warned of an ascent of only 400 and something metres. So that was basically 2 passes conquered within a few hours of starting the ride. 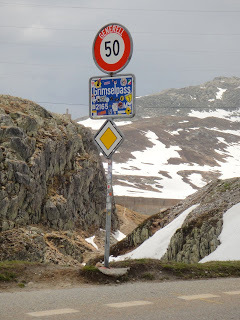 The descent down the Grimsel pass is an enjoyable one, but there are quite a few dark tunnels to pass through, where you try to get through as quickly as possible owing to the low visibility and the fact that cars may not see you so well. It is fine as long as the cars see you enter the tunnel, but if they come up from behind and aren't expecting you then it isn't ideal. The other problem with these tunnels is that it is sometimes difficult to make out the road surface, and the likelihood of hitting a pothole without warning in increased. One hopes that the quality of the roads in these tunnels is kept higher than the quality of the surrounding roads, due to this low visibility factor putting cyclists at more risk of an accident which in normal visibility they could avoid. As I was descending the Grimsel pass towards Innertkirchen where the Susten pass begins, I was keeping an eye on my GPS device's altitude reading. The fact that it was getting lower and lower meant only one thing, that there would be an awful lot of climbing yet to come on the final pass. With this in mind I stopped in Innertkirchen to eat the remainder of the food I was carrying with me, to fuel myself for the ride. The journey up Susten is a very scenic one as the route passes through lush farmland in it's lower stretches. The temperature by now was a little overwhelming for me, and this combined with the amount I had already climbed in the previous 2 passes, I was beginning to suffer. It was even more apparent how much I was suffering when a veteran cyclist passed me on an uphill section with complete ease. As I reached higher up the pass I felt a few spots of rain, and was praying that it would start to rain properly so I could cool off. My prayers were answered and within 10 minutes or so it was pouring down. It was so refreshing and for once I was enjoying cycling in the rain. The reduction in temperature was so much so that I had to stop and put on my jacket as I was becoming rather cold. The progress up the second half of the pass was constant but slow, and I was stopping to take short breaks for each 500 feet climbed. When I saw the top was approaching I breathed a sigh of relief and pushed steadily onwards. Upon reaching the top itself, I was extremely happy knowing that the worst was over and I had done what I set out to do. I paused to take some pictures of the sign displaying the altitude and then began my descent. This time the descent was not pleasant. The fact that it was raining heavily meant I was constantly braking to keep my speed under control, for fear that if I didn't then I wouldn't be able to stop if needed. I was also beginning to shiver from my bottom half being soaked by spray coming up from my tyres. At least I was better prepared than on previous occasions in terms of the additional clothes I brought with me in my rucksack. As I was descending I was again keeping a close eye on the altitude readings. I remembered the altitude from when I had started the ride in Göschenen, and was hoping that it would be downhill all the way from the top of Susten to Göschenen. It wasn't however, and as the altitude reading dropped below the starting altitude I knew there was still some additional climbing to be done. Luckily the climb was only a few hundred vertical metres or so, but by this time I was crawling along like a snail. When I pulled in to Göschenen station I was elated to have finally finished. 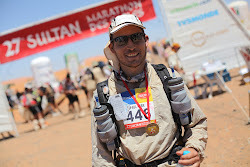 Looking at my GPS device, the total distance covered was 122.35km and 3,607 vertical metres. That is about 70% of the distance and climbing that I will be doing in the Marmotte in July, so if I can become comfortable with this route then I am sure I will be in good shape for the event itself. Hi Katzebemol. Thanks for your comment. This route is truly beautiful and I would recommend it to any really fit cyclist. I would not recommend it to your average cyclist though, as they might end up collapsing from exhaustion :-).